Why There Is More Holding Women Back from Wellness Than You Think | Yellow Co.
We live in an exciting time, where words like mindfulness, consciousness, self care, and meditation are becoming a part of mainstream dialogue. Growing up in a toxic household with a mother who suffers from mental illness, I learned anxiety and depression as a normal and natural part of life. I internalized these patterns so deeply that in my 20s I thought that regularly thinking of suicide on the way to work was normal. When I started my healing journey, I was insatiable for information about how to transform my negative, self-limiting beliefs and heal from my past. I noticed that for the large part, I didn’t hear a Black female voice as part of this conversation. I didn’t know it at the time, but it was this lack that led me to start my company Curvy, Curly, Conscious. Through my work with Curvy, Curly, Conscious I have the privilege of intimately interacting with Black women across the country and beyond who are interested in creating a space for healing in their life. One overarching theme I have encountered time and time again is that Black women feel they don’t deserve the right to heal. Women of color, and Black women in particular, are not at all new to the healing arts, but we are just learning how to allow this for ourselves. We can take care of our lovers, nurture our children, grow our businesses - but when it comes to our own personal self-care, we somehow draw a line in the sand. Many Black women I encounter suffer from the Superwoman Syndrome, which affects all women. However, Black women experience it in a very unique way. The Superwoman Syndrome is pretty much what it sounds like. We are expected to do everything - and to do it all well, at the same time. To prepare healthy food, to raise intelligent children, to be a sexual goddess, to clean the house - and to do it all without complaining. I mean who can keep up with all this? Black women are taught historically, socially, on TV, in movies, and in literature that we are strong. “Ohh that’s a strong Black woman.” “Look at those strong legs!” At first it seems like a compliment, like, “Oh, thanks for calling me strong.” But the insidious part about it is that it implies that our strength means we can take more pain. Black women are about half as likely to be prescribed pain medication. Black women are also about three to four times more likely to die of pregnancy or delivery complications than White women - why? Sure, there are various complicated factors to justify those statistics - but one is the fact that Black women don’t feel they have the right to complain. And we are perceived as being really good at taking pain. I am thrilled now to see a wave of Black women who know they deserve to take care of themselves, that self-care is a not a selfish act; but instead, a “self-full” act in the words of healer and TV Host, Iyanla Vanzant. The most exciting part about our Curvy, Curly, Conscious movement is that I get a front row seat to the self-love revolution. 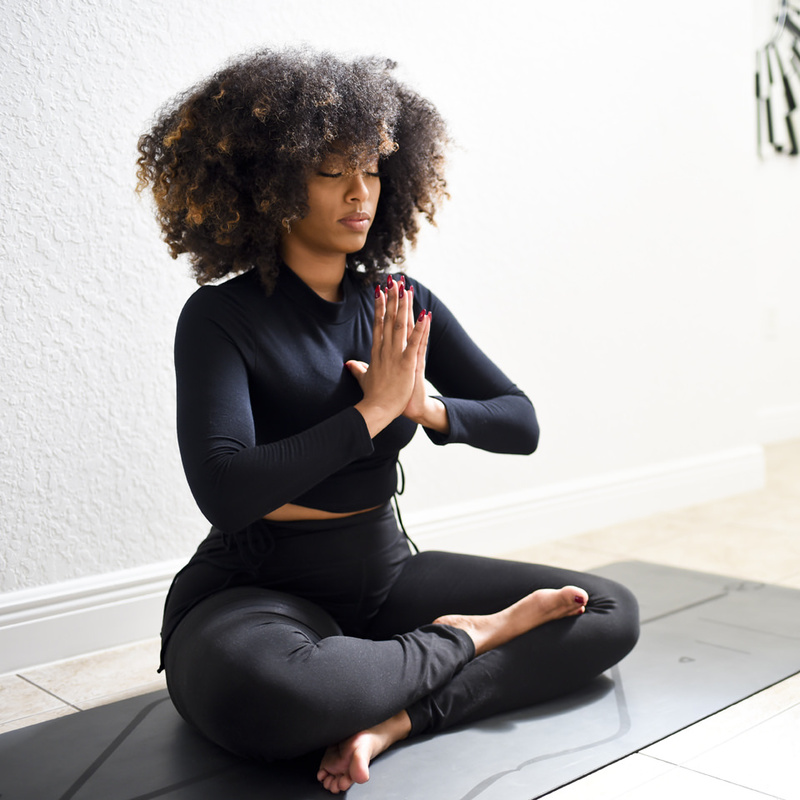 We get to see women open the invitation to the self-love journey and release the guilt around taking care of themselves. Healing is a birthright. Taking immaculate care of yourself is not an option. Women are the ones who will heal the next generation and move us towards the next level of consciousness. It is our duty to give ourselves the space and time to prepare for that undertaking. Below are a few of my favorite wellness tips. Use them to truly take the time to take care of yourself. I use it for deep breathing, headaches and meditation. Resist the temptation to look at your phone for the first 30 minutes and last 30 minutes of your day. I know it’s hard! I am a willing participant in the social media generation, but when I resist the urge I find I am more centered and calm. As soon as you pick up your phone, your energy is going outward. You are being reactive. Claim the first and last part of your day as your own. I think meditation can be helpful for anyone who wishes to achieve a more centered state of mind. For those just starting, I recommend guided meditations. The Insight app offers several guided meditations, or you can find options on Spotify, iTunes, and YouTube. I also have a Meditation Mixtape that is available on all streaming platforms. Guided meditations are a great way to start your meditation journey. Shelah Marie is a performer, host, and meditation enthusiast dedicated to helping others reach new levels of insight in their lives. She shares her unique experiences through her celebrated brand (Curvy, Curly, Conscious), her anticipated mediation mixtapes, and through her compelling content on notable social media platforms. Shelah has found meditation to be her ultimate healer throughout her life’s journey and strives spread her knowledge to women throughout the world.